CEFCA Foundation is an institution of the Government of Aragón which aims at creating in Teruel a center for research in Astrophysics and Cosmology, called Centro de Estudios de Física del Cosmos de Aragón, whose activities focus on the technological development and operation of the Observatorio Astrofísico de Javalambre (OAJ) and on its scientific exploitation. The main research lines of CEFCA are Galaxy Evolution and Cosmology. The Javalambre Auxiliary Survey Telescope (JAST/T80) is an 80cm Ritchey Chrétien telescope with a large field of view of 2 deg diameter, particularly defined for carrying out large sky photometric surveys like J-PLUS. T80Cam is a wide field camera installed at the Cassegrain focus of the JAST/T80 and equipped with by a 9200 x 9200, 10μm pixel high efficiency CCD. 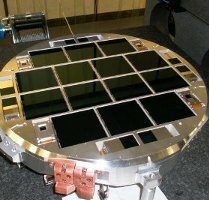 This full wafer CCD covers a large fraction of the telescope’s field of view (FoV) with a pixel scale of 0.55"/pixel. T80Cam is design to perform the Javalambre-Photometric Local Universe Survey (J-PLUS) which will observe through a set of 12 carefully optimized broad- and narrow-band filters. 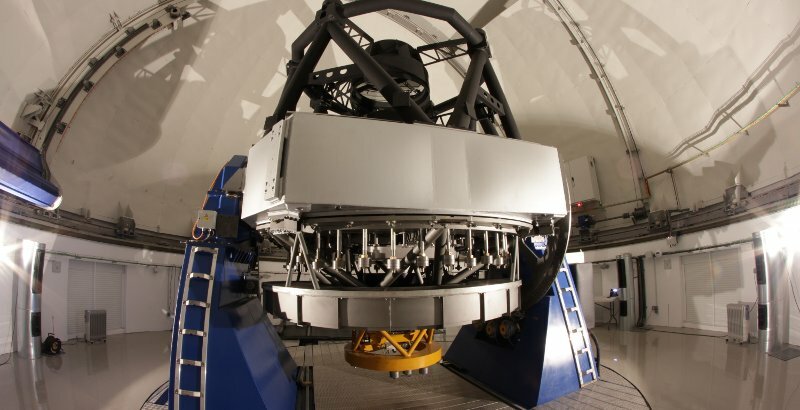 The Javalambre Survey Telescope (JST/T250) is an 250cm Ritchey Chrétien telescope with a large field of view of 3 deg diameter, particularly defined for carrying out large sky photometric surveys like J-PAS. JPCam is a wide field camera installed at the Cassegrain focus of the JST/T250 and equipped with a mosaic of 14 by a 9200 x 9200, 10μm pixel high efficiency CCD. These CCDs cover a large fraction of the telescope’s field of view (FoV) with a pixel scale of 0.2267"/pixel. JPCam is design to perform the Javalambre-PAU Astrophysical Survey (J-PAS) which will observe through a set of 56 carefully optimized broad- and narrow-band filters. 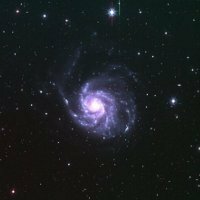 The image navigator allows you to visualize and interact with the astronomical images taken with the facilities of the Observatorio Astronómico de Javalambre. 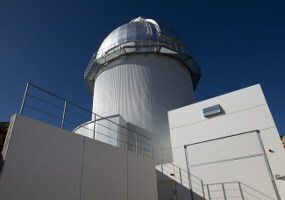 The Observatorio Astrofísico de Javalambre (OAJ) is an astronomical facility located at the Sierra de Javalambre (Teruel), in particular at El Pico del Buitre, 1957 meters above the sea level, close to the village Arcos de las Salinas. The two first main projects defined to be conducted at the OAJ are J-PLUS (Javalambre Photometric Local Universe Survey) and J-PAS (Javalambre Physics of the Accelerating Universe Astrophysical Survey). J-PLUS and J-PAS are unprecedented photometric sky surveys of 8500 deg2 visible from Javalambre. 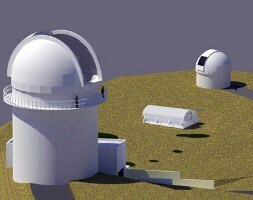 CEFCA operates the OAJ (Observatorio Astrofísico de Javalambre). 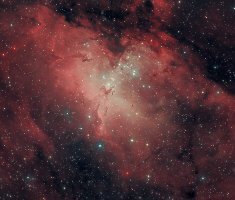 This project started in 2010, comprising not only the design and construcción of the two above telescopes but of the whole civil work, related installations and infrastructures for the proper operation of the telescopes.